The Making of a Jewellery Holder — Christina Made It. My mum has A LOT of jewellery and wanted a jewellery holder for her birthday. I couldn't find anything in the shops that would hold all of the pieces she owned as well as have them all out to view (a much better way to choose what to wear each day when you can see it all) soooo I figured I would make one instead. I started by making the design of the back board on the computer in Illustrator I made an outline of the New York skyline with the windows of the buildings being the holes for the earrings to hang. The kind people at Jewsons gave me a free piece of scrap wood which I gave to the Laserman to laser cut the design out of. I also got the screw holes pre cut using the laser to make sure everything was evenly spaced and alighted correctly. I sanded down the top surface in preparation for the spray paint. I sanded it down very unevenly and also dropped the sander which made a big dent which I then had to cut out - oops. Very important to wear a mask and goggles as the wood dust is carsonagenic. The whole thing was then spray painted with the base coat. It took about three even light coats to cover with a light sanding (sand paper) in between the coats. I also had the discs for the front of the necklace hooks laser cut into the same piece of board along with some 'washers' to support the hooks from the back (the discs with holes in). All the discs were bonded to the posts using apoxy resin (I use this stuff to join everything!) it's a two part bonding glue that you mix together. The squeezy tubes are very messy, I think they have since redesigned the packaging though. Two holes were drilled into the bracelet holder for the rods to go into. They weren't the neatest of holes (no offence Danny, thanks for drilling them for me!). I had to use some filler to fill in the gaps. 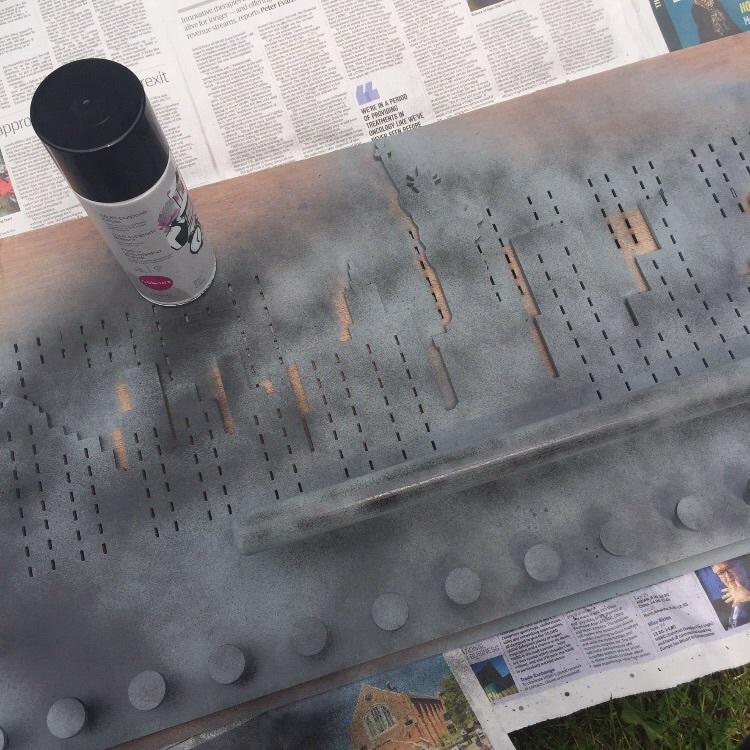 Then I sprayed everything with primer - the grey spray paint which is a base coat for the main paint colour to adhere to. Each hook I drilled a hole in ready for the screws to go in, using the centre punch and a hammer to make a dent for the drill to align to. All the pieces were screwed into place, with the wooden washers on the back, for structural support. Washers to support the weight of the jewellery. Side view of washer attachments for the bracelet holder. Finished base coat with all the fittings attached. Four coats later... The whole piece had a nice black gloss finish. It took me a good couple of months to complete, so I don't think I'll be making any others but when you can't buy what you're looking for the only other option is to make one it's very satisfying to see the finished piece. To fix it to the wall (this actually proved to be the most confusing and complicated part for me, this is definitely not where my creative skills reside) I settled on using a wooden baton which was drilled into the wall with metal French cleats (B&Q) and then the same attached to the back of the holder but the other way round. It was important to have the baton so that the holder came away from the wall to allow the earring backs enough space behind to hook them through. Here is the finished result, it can fit about 40 necklaces, 40 Bracelets and 40 sets of drop earrings. The only thing it doesn't hold is stud earrings and rings, this is because my mum, who I made the holder for only wears drop earrings and all the rings she owns, are on her fingers. I could have added a small shelf for these or made a separate dish to go on the table top below so it would have been possible to cater for this.